Ten June: My Blog Birthday! Guess what happened a year ago today? I was more or less scared out of my mind to start blogging. Honestly, I thought it was kind of weird. What kind of crazies post pictures and details about their projects, their home and their lives? This crazy. And I love every. single. minute. of. it! It actually took me about a month to tell my closest friends that I had started a blog. And about six months after that before I told all of my other friends and family. Do you know who gave me the courage to share my blog with all of those people? All of you. Seriously! It was the love and support from all of you crazy kids that truly pushed me, kept me going and left me inspired. Blogging is truly one of the most supportive communities I've ever seen- this group constantly and consistently addresses each other from hundreds or even thousands of miles away with the sweetest, kindest and most genuine comments ever. I'd like to think that my writing has matured, my content has evolved and my design style has grown. But above all, I know for a fact that I've learned the most about support. And I have definitely learned that from all of you! So thank you, my friends! Thanks to each of you for the last year of sweet words, funny comments, true inspiration and overall support. Alright, enough with the sappy stuff... basically, you guys rock my world. I am so excited to see what this next year of blogging holds for me! 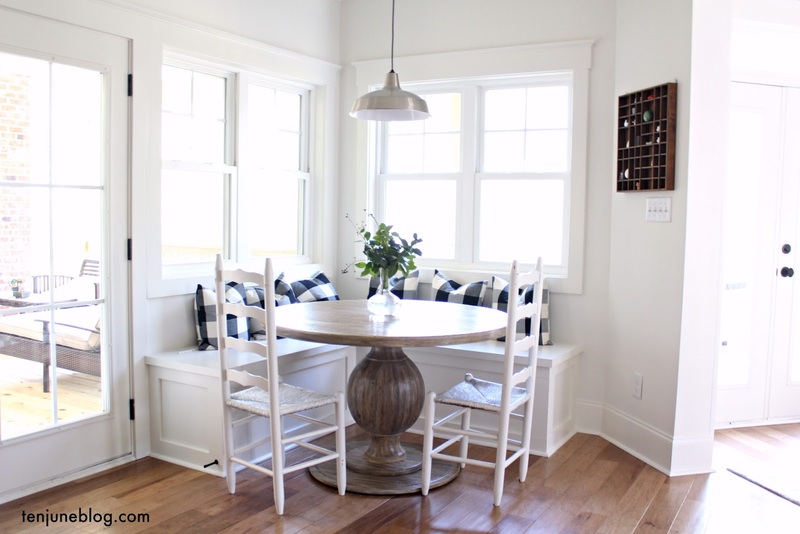 You can check out most of the last year's projects and the before/after scoop on my House Tour tab. I promise a bunch more projects (potentially a finished master bathroom renovation, but don't hold your breath! ), a lot more laughs and hopefully a whole lot more mutual love and support. Happy blog birthday, Ten June! 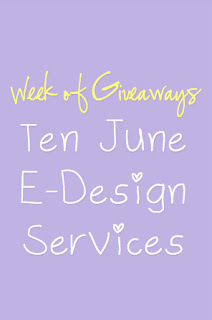 where I'm giving away one free e-design to one her her readers! You have done some fabulous things in just one year! Congratulations! Michelle, happy blogiversary!!! Looking forward to the future over here at Ten June! Happy blogiversary! I'm so glad you started your blog! Happy blog birthday!! So funny to read that you were hesitant to tell all of your friends and family when you first started. I'm 4 months in and haven't told many people either. PS> I read your first post. What happened to on the burner & on the nightstand? I'd love to know what you are reading & cooking. I'm always looking for ideas for both. I can't believe you've only been doing this for a year! I still haven't told most of my family about my blog. One of my friends spilled the beans to my neighbors at a bbq we had last weekend, so that secret is out. I'm kinda relieved about that one since I never know how to bring it up! It's awesome that you had the courage to start the blog in spite of what you thought others might think. I hope you have time to blow out a candle on your blog's special day! yay! happy blog birthday to you! :) are you cgonna celebrate with a party? maybe head to home depot, maybe a little bed bath and beyond if there's time? Crystal- I somehow got off the food and book feature bandwagon, but maybe I'll hop back on soon! Those are certainly two of my passions that I'd love to keep highlighting. Thanks for letting me know you'd love to hear about them! Wow, this is exciting. Happy.happy.happy blog birthday! PS-I think at one year birthdays it's traditional for an individual cake to be involved...and I think you should get to smash your whole face in it if you'd like. i am really happy i could make your blog what it is rhonda bear. Happy Birthday Ten June! Can't wait to see what you have in store for us next!! Happy Blog Birthday!! Love all your posts, and still laugh about the Gopher!! muuuuwaaaa! Happy Blog Birthday! I love reading your blog...it's one of the first things I do each morning, after I get my coffee of course! I can't wait to see how your master bathroom turns out! Yay for your blog birthday!!! So happy to know you through blogging! It's great isn't it?! We still need to get together with Lauren too! Yay! Happy blog birthday! Can't wait to see what you have in store for the next year! Happy blog b-day! So glad you decided to start blogging a year ago! Too funny about not telling your friends -- I did the same thing. My husband said something in front of my best friend (since 4th grade) about "you should blog about XYZ" and she was like "WHAT?! You have a blog? Why have you been keeping that from me?!" How exciting - and it probably feels like several years! I just started blogging back in May and I already feel like a veteran. It's truly a wonderful community and I'm SO happy to be a part of it. Ok I'm a day late, but still wanted to wish you a very happy blog birthday! Congrats lady! Isn't fun to go back and read your first couple of posts? I love to do it and see how far I've come. Only a year. I can't believe that. I feel like I've been reading your blog for far longer as the content and design is always so good. Happy blog birthday! Happy Blog Birthday! I just found your blog and love it!! I felt the same way when I started my blog. I still think some of my friends and family are like "what is she doing?" But I don't care, I love it too!